These new miniatures, i'm delighted to say, are the final type necessary for Spanish armies in the first part of the 16th Century, they are suitable for both the Tarasmara Spanish and the Caroline Imperial lists in the new Fields of Glory Renaissance army lists. 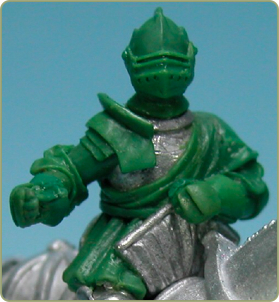 Called Gent d'Armes, they are the final development of Spanish knightly classes, fully armoured from head to toe in plate armour, they fought with lance and a selection of hand weapons classed as 'swordsmen' under the FoGR rules. There is some debate about the lances used, but we will give these heavy ones, unless requested. These Gent d'Armes are shown on unarmoured horses, which some of our research has found we in use, but when the have the fully armoured horse, these too would be suitable, and will be supplied if requested. Nick is still working on our armoured horses, horse being the part of his job that he finds most challenging, and armoured horses are a bigger challenge still.